The big race of the week was the Lytham Green Drive Five, which was a Wesham club championship event and also hosted the Lancashire AA County Championships. 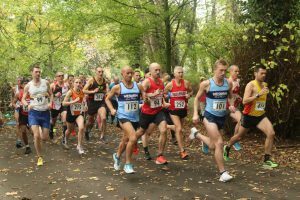 With a big entry for this very popular race it was a conservative start as Wesham’s Rob Danson and his running mate Dave Norman from Altrincham quickly took the lead and pushed on. Rob, with a recurrent problem with his knee, was on the comeback and he and Norman ran together for 4 miles until Danson pushed on for the finish and came in clear by 19 seconds to win in 25:41. The ladies winner was Blackpool’s Emily Japp who broke her own course record by 22 seconds to 27:47, the pair taking the Lancashire Men’s and Women’s 5-Mile crowns for 2018. For Wesham Simon Denye had an excellent run to finish 7th in 28:40; he has come on leaps and bounds from injury and is nearly back to the top. Andrew Harling was 20th in 30:08 and David Taylor conserving energy in 23rd place with 30:21. The Wesham men’s team 2nd behind Red Rose overall by only 4 seconds but 8 points in a very close match, but Wesham have been given the Lancashire Team Gold ahead of their rivals, due to a shortage of Lancashire qualification in the Red Rose team. The Wesham women were not at full strength, but there were personal best performances galore and Kay Twist was first in 31st woman’s position with 39:18 and 140th overall, 5th W45. Louisa Denye had a fantastic run to clock 41:28 and place 46th woman and 188th overall. Elizabeth Johnson was 53rd and 199th overall in 42:16 and Maureen Danson 59th and 206th with 42:41. The Wesham women’s team were 10th overall and 7th in Lancashire. The Wesham Men’s Masters’ team (Denye 2nd; Phil Quibell (9th in 31:34); and Matty Chamberlain (15th in 32:29) were second behind Red Rose again (18 seconds; 2 points) and the Wesham women 5th (K.Twist 18th; L.Denye 29th; and E.Johnson 34th). Phil Quibell was the first M60 and 35th overall in 31:34; Thomas Crabtree 38th in 31:59; Matty Chamberlain 6th M45 and 43rd overall; Neil Gregson 45th in 32:35; Nigel Shepherd 3rd M60 just pipped for 2nd and 50th overall with 32:46; Stuart Clayton 81st in 35:21; George Kennedy 7th M60 and 98th with 36:14; Rob Wallace 100th (36:20); Martin Allison 102nd (36:24); Stuart Topping 139th (39:17); Ben Wrigley 150th (39:39); Robert Brown 157th (39:48); James Danson 160th (39:53); Stephen Twist 186th (41:17); Finlay McCalman 202nd (42:26); Peter Rooney 216th (43:27); and Peter Cooke 255th (45:25). For the women Kerry Eccles was 62nd and 7th W55 in 43:32; Jo McCaffery 79th and 245th overall in 44:53 and Pauline Eccleston 82nd and 249th with 45:01. Antionette Holton was 96th and 268th in 46:11; Diane Blagden 100th and 274th with 46:26; Sally Deacon 106th and 286th (47:06); Clare Belfield 116th and 298th (47:52); Julie Rooney 123rd and 305th (48;15); Emma Davies 137th and 322nd (49:20); Emma Wright 142nd and 328th (49:36); Sharlan Butcher 149th and 33rd (50:12); Sue Rigby 152nd and 340th (50:27); and Nicola Carter 157th and 345th with 50:56. In the Standish Hall Trail Race autumn edition in appalling underfoot conditions Dave Waywell finished 6th M70 in a very high quality and competitive competition in a time of 1:06:56 for the hilly 2-lap figure-of-8 6 miles and came in 134th overall. The leading M75 was just in front in 1:03:38 (126th). Chas and Angela Colby ran the Langdale Half Marathon in Cumbria on Saturday, now run under the auspices of Brathay Manor, who run the Windermere Marathon. Run over one of the toughest and most scenic courses in the country the route starts in the Great Langdale valley and traverses the ridge into Little Langdale and loops round Ellterwater. For those who like it that much a second lap completes the marathon! Chas finished an excellent 68th in 1:52:45 for 15th M45, and Angela was 28th woman, 5th W45 and 141st overall in 2:04:19. The conditions were overcast and damp but there was little wind. Thomas Crabtree ran the 7th fastest time of the day at Saturday’s Lytham Hall parkrun, completing the two-lap 5km in 18:56 for an age graded performance percentage of 68.13%. Jonathan Lawson ran 21:49 for an M50 grade of 68.14%, coincidentally. Anne Mayers-Smith recorded 22:56 for W40 67.08%. Troy Watson returned to action and threw down 24:25 for an M50 grade 60.89%. Ben Wrigley ran 25:47 for an M35 52.17%. Steve Myerscough, on the steady road to recovery ran 23:00 for an M40 61:16 age graded percentage at the Preston parkrun, and Robert Brown clocked 26:13 for M60 61.73%. Chris Pike was out for his 120th run at St Helens Victoria Park and ran 27:10 for M40 51.41%. The Wesham parkrun tourists headed to Dewsbury where David Taylor ran the fastest time of the morning with 18:56 for a senior age grade of 68.66%. Stephen Gore had the 7th fastest time of the morning with a good 20:34 for an M35 grade of 64.91%. Megan Gore ran a JW11 46.14% with her time of 36:03 with Vicky in company for 36:04. Anne Berry was on her travels and ended up at Tambourine Mountain parkrun near the Gold Coast in Brisbane Australia. She ran 33:49 in very warm conditions for a W55 age grade of 54.26%. James Mulvany was running with his son Evan in the Fell Foot parkrun at the southern end of Windermere where they clocked 24:37 (JM10 69.13%). Emma Lund was out again in the Lancster parkrun on the hilly 2-lap Williamson Park course with a time of 23:24 for W35 63.89%. Dave Marsland was the leading Wesham runner in the Blackpool Stanley Park run where he recorded 24:01 for M60 67.94%. George Kennedy ran 24:05 for M60 67.20% a close run between the two. Suzanne Leonard also clocked 24:05 for W45 67.96%. Andrew Moore ran 27:09 for M55 57.095 and Graham Cunliffe 28:10 for a cautious M60 57.93% with a sore calf. 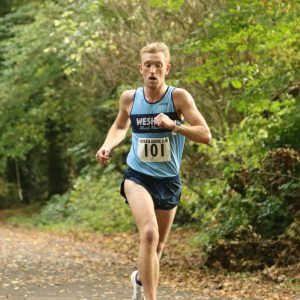 Finlay McCalman ran 28:52 for M50 52.77%. Peter Cruse had the 8th fastest time at Fleetwood Promenade with a swift 20:38 for M55 75.12%. Brian Jones ran 31:36 for M55 49.47%.